The score increase will be measured from the most recent SAT or PSAT; an official score report must be furnished. If the guaranteed score increase is not achieved, I will tutor the student free of charge for additional sessions proportional to the amount of increase not achieved. For example, if the guaranteed increase is 160 points, and the student raises his score by only 100 points, I will provide 6 additional tutoring sessions free of charge. Complete all assigned homework to the best of his or her ability, including practice tests. 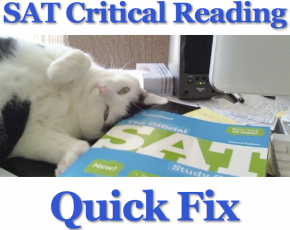 Complete the last session no longer than 7 days prior to taking the SAT.